As the perennials are starting to peak their way through – it’s always interesting to see what will come up each year – I’ve started to think of how I can create simple, but unexpected flower displays and vignettes throughout the garden (and indoors too). 1. Cans: Most everyone has used cans, but instead of them heading to the recycling bin, use them. 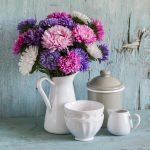 Coffee cans, pasta cans, or any type of can with a fun label adds an element of interest and color to a flower arrangement. 2. 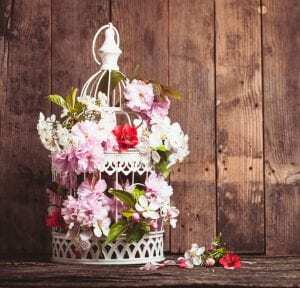 Vintage Bird Cage: Bird cages, large or small, add an interesting architectural element to a typical flower arrangement. They are unexpected and add a touch of whimsy to display a gorgeous array of color. Place one or a cluster of birdcages on the table to create the perfect centerpiece, or hang varying sized cages from the trees or pergola above. Alternate a few with candles and the magical display will take you right into the evening hours of Summer. 3. Large Barrels: Another creative idea to add height and drama to a typical garden is to look around for unusual architectural elements, like this barrel. Not typically thought of for a garden, this old and worn barrel went from nothing to a gorgeous garden planter within minutes. 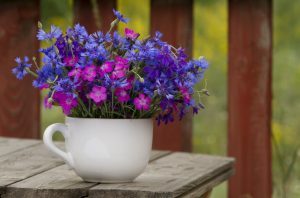 Hung from a tall garden hook, this unexpected planter displays the most striking deep purple Spring flowers. Truly the most unusual elements in your home or garage can become fun treasures in no time. 4. Drawers: From an old desk or a vintage dresser, drawers of any size are usually easy to come by. Scour thrift stores or garage sales, and you’re bound to come across a few old drawers or a piece of furniture where the drawers can be removed and upcycled. Once taken out, the drawers become perfect, easy-to-move boxes and allow you to play with height by stacking. Stack a few more, add a piece of glass, and a newly created side table and planter box can be created. Planter “drawer” boxes add a fun and interesting element to a garden rather than the standard boring, old bed. 5. Paint Cans: Such a cute, fun, and unusual idea. If you’re a DIYer (like me), I’m sure you’ll love this adorable idea to display flowers. Once you’re done painting your walls, instead of tossing the old cans, recycle them. Get creative with your newly created display with drips of eye-popping color. Painting or Mod Podging a picture on the outside is also a fun alternative. If you’re not a DIYer and don’t have old paint cans laying around (we don’t all have that? haha), new and fairly inexpensive paint cans like these can be found at local big box hardware stores.